Some of my earliest memories are of sitting at the kitchen table and watching my dad draw pictures for me. He was not an artist or an architect, but a construction worker who liked to draw for his kids and make us laugh. He didn’t know it back then, but he was planting a seed. My next memories of drawing weren’t quite as happy: I took to doodling in class and, unfortunately, this was typically met with punishment. During detention, I’d simply spend another hour drawing in my notebook. Doodling during meetings is important to me. I keep my notebooks not for the notes, but for the sketches in the margins and drawings across the pages. It shouldn’t have surprised anyone, then, when I chose to study landscape architecture at Purdue. These days, I literally draw and sketch and dream for a living. Yes, of course, there is a part of me that wants to find some of my childhood teachers and say, “How about me now? !” However, given that I’m supposed to be all grown up, I know I should focus on more mature and productive activities, such as asking this question: should we return to embracing drawing as a form of communication and creative outlet at the youngest of ages? Drawing is a universal language that can convey ideas and emotions. It used to be taught as a main form of communication. For some people, it’s an important way to help process information they’re hearing; I have many colleagues who doodle during business meetings because it helps them organize their thoughts. In fact, studies suggest that doodlers retain more information than non-doodlers. But, somehow, we got to a place that doodling and drawing are perceived primarily as distractions. I wonder how many kids still get punished for doodling during class. I’m not an educator and can’t imagine the pressures on teachers to meet other basics. So I won’t preach about re-incorporating drawing into the curriculum. But I know that as a professional, I never throw away my notebooks, and it’s not because of the notes; I only care about what I drew in the margins and doodled across the page. There’s something to be said for that, isn’t there? Perhaps the best I can do is to encourage youngsters who love to draw to keep it alive, keep sketching, keep doodling, keep drawing. Would it be going too far for me to tell them that the next time someone tells them to stop doodling and start paying attention, to share that doodlers are smarter? Or maybe the kid who loves to draw can just get back at disapproving grown-ups by going on to become a great landscape architect. ... 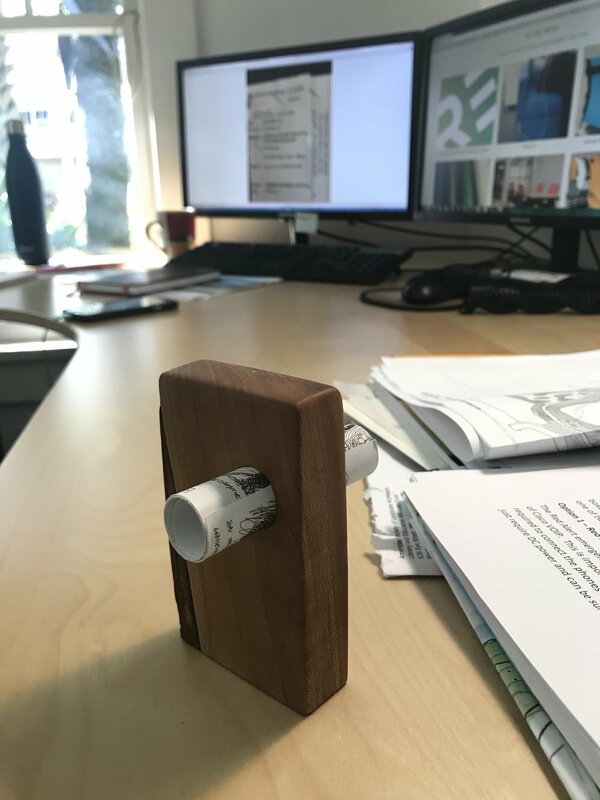 I keep old doodle “scripts” on my desk in a piece of cherry that came from a tree at my childhood home. My dad and I recently used the tree to make a dining table for my family.